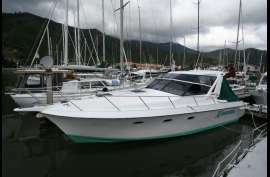 Features Hot and cold pressure water, hot from 220 and engine, two showers, 12/230 v fridge, Compressor freezer, shore power, 12 volt charger, Dual battery setup with link, 2 x Wipers, Salt water hose, Bow Thruster, trim tabs, auto anchor. Genesis 320 European. GRP, 230hp 6cyl Volvo diesel, Accom for 4, gas cooker & oven, 12/230v fridge, compressor freezer, Furuno GP 7000F GPS/Depth Sounder, Bowthruster, large open cockpit and helm station. Cockpit covers, teak cockpit and boarding platform, walk through transom. Serviced and antifouled March 2018.